Upon reaching a much-awaited consensus to reinstate remaining dismissed workers, SsangYong Motor, the local unit of Indian car maker Mahindra & Mahindra, vowed to make forays into overseas markets with three new models to be released next year, the company said Sunday. The carmaker’s management, labor union and the Korea Metal Workers’ Union agreed last week to reinstate 119 dismissed assembly workers who had been let go in 2009 when then-largest shareholder China’s state-run automaker SAIC Motor pulled out. The agreement ended a nearly decadelong conflict that had become a social and political issue. “We will enter overseas markets Australia and Europe on three new models launched next year. 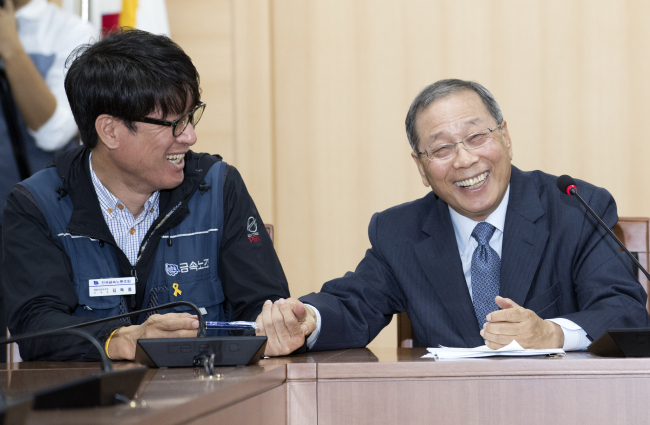 Amid a difficult situation, we have invested 400 billion won ($357 million) annually in new vehicle development and facilities,” said SsangYong Motor CEO Choi Jong-sik, after the press conference held to announce the reinstatement Friday. The three models are: a successor to Korando C SUV code-named C300, a gasoline-powered variant of the C300 and a Rexton Sports pickup with a longer body. The SUV powerhouse has all eyes set on sales of its SUVs in Australia to be sold through its first sales branch ever overseas, starting November. At least 30 fired employees have died since they were dismissed in 2009. During his state visit to India in July, Moon had urged Anand Mahindra, the executive chairman of Mahindra Group, which owns over 70 percent shares of SsangYong Motor, to reinstate former workers in a meeting held on the sidelines of the event. The beginning of the longstanding issue at SsangYong dates back to June 2009, when SAIC Motor fired some 2,600 employees after filing for court receivership. Angry members of the labor union staged a sit-in protest for 77 days at the factory in Pyeongtaek, Gyeonggi Province, which was dispersed by a special police squad. In the process, some 100 related officials were arrested, including SsangYong Motor`s union leader Han Sang-kyun. Some 1,700 workers chose voluntary resignation and 454 unpaid leave, while 165 workers who refused both options were fired. Mahindra Group purchased SsangYong Motor in November 2011, and in 2013 it reinstated the 454 workers who had been sent on unpaid leave. A total 118 laid-off workers have been put back to work between 2016 and this year, and the latest decision to reinstate the remaining 119 former workers puts an end to the plight. SsangYong Motor’s compact SUV Tivoli, launched in 2015, put the carmaker back on track, spearheading demand in the local compact SUV market, and sold 63,693 units in the first year, the company said. Among SsangYong Motors’s top-selling SUVs are the G4 Rexton full-size SUV and Rexton Sports pickup truck.